The Cardinal's Base | Following and loving the Cards, even though I live in Virginia. Following and loving the Cards, even though I live in Virginia. What do you do when your team gets no-hit?? I love no hitters. They are one of my favorite things about the game of baseball, seeing the pitcher put on such a dominating performance that he literally shuts down the other teams offense completely! I love watching no hitters and for the first 18 years of my life I’ve been thankful that I have never seen my Cardinals get no hit. Before last night’s game the big talk about it was Carlos Beltran making his return to the big apple, his first game at Citi Field since leaving the Mets last summer. By the end of the night though, the spotlight belonged to the man on the mound. I had a migraine last night so I didn’t watch the whole thing, but I woke up just in time to see the final 6 outs of the no hitter. For the first time in my baseball fan life, I wasn’t sure whether to celebrate or not. When the final out came and the no hitter was complete, I wasn’t sure whether to be pissed off, or happy that I got to watch another great moment in baseball history? I guess you could say I was a little of both at the end of last night’s game. Yes I was ticked off that the Cards mighty offense couldn’t get a single hit, off the Mets no less. But at the same time, it was a big moment in baseball history, I knew all about the Mets never having a no hitter, I always wished that i’d get to see a Mets pitcher finally throw one and end that drought for the franchise. I did get to see that drought end just like I wished for..I just hadn’t expected my Cardinals to be the ones getting no hit obviously. Speaking of the Cards, as most baseball fans know, the defending world champs are in a funk, a BIG funk. The month of May was a pretty rough month for us. Berkman is gone, probably till August. Jon Jay, and Allen Craig both spent time on the DL. It was just a bad month in St.Louis. I remember waking up yesterday and telling myself “May is over finally, time to turn it around in June” Obviously the month of June isn’t off to a great start either, but hey. there’s still 29 days left this month, plenty of time to turn it into a good month for the Redbirds. Today is a big day in Cardinal Nation, Tonight at Busch Stadium before the start of the Cardinals-Braves game, the Redbirds will offically retire #10 for Tony LaRussa. Cardinals fans pretty much knew this was coming sooner or later, and I’m glad to see the Cardinals did it as quickly as they did. 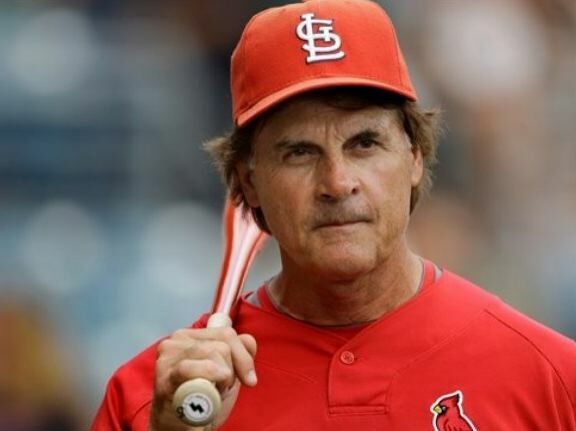 Tony LaRussa was the manager of the Cardinals for 16 seasons, in those 16 years He helped lead one of the greatest runs in Cardinals history. The Cardinals made the playoffs nine times in his career. During the 2000’s decade it seemed like the Cardinals were among the National League’s best each and every season. Then of course came the 3 magical years of 2004, 2006, and 2011. In 2004 the Cards were the best team in the National League all year long, then in the postseason they beat the Dodgers and Astros to send the Cardinals to the their first world series since 1987. Even though the Cardinals lost in the World Series that year, I will always remember it as the year where I really began to follow baseball and the cards day in and day out. I think I speak for all of Cardinal Nation when I say, Thank You Tony!!! The 2012 season if officially underway. The Cardinals and Marlins opened up the new year Wednesday at the dazzling new marlins stadium (which according to Orel Hershiser looks like a space ship and a cruse ship had a baby.) The game featured an awesome national anthem performance, a lady hanging upside down in the outfield concourse, showgirls that looked like they belonged in Las Vegas, oh and a dominant performance by the Cardinals. I don’t think I’ve ever seen a better performance from Kyle Loshe. He took a no-hitter into the 7th and had everything going for him. David Freese picked up where he left off last October driving in two in his first at bat. The Cardinals did pretty much everything right Wednesday night. We keep playing like that and the central is ours for sure. One thing that was cool and weird at the same time the other night was seeing Mike Matheny in the dugout calling all the shots. Well I’m really glad it was Mike who got to take over for Tony, I’m so used to seeing Tony LaRussa in the dugout, so seeing Mike instead of Tony will take some getting used to. Another thing to get used to is not seeing Albert in the 3 spot or in the dugout (something that ESPN mentioned like what 300 times during the broadcast?) But I think that’ll be easier to get used to seeing as we’re still a great team even without him. so until next time, GO CARDS! Baseball is back my friends. After a long winter, our favorite sport is back for another season. Enough with Spring Training and enough with predictions, it’s time to see how the 2012 season will play out. Obviously I did not finish my season predictions and I apologize. I have been extremely busy over the last few weeks with a lot of different things and I have had hardly any time at all to blog. But I am back now and just in time for opening day. This should be a really interesting season for the Redbirds, New manger, new pitching coach, new first basemen. Albert Pujols is not walking through that door, Tony LaRussa is not walking through that door. The Cardinals have a whole new identity and it will be interesting to see how it all works out. It starts tonight against the Marlins. Kyle Loshe is set to make the opening day start for the Redbirds with Chris Carpenter on the DL. It is unknown when Carp will be back but hopefully it will be sooner rather than later. Enjoy Opening day you guys!! Today we continue the UCB project for March by taking a look at the National League East. The National League East is in my opinion going to be the most interesting division in baseball this season. You have the Phillies, the Braves, the Marlins, and the Nationals all of whom I believe could compete for a playoff spot. 1. Philadelphia Phillies- The Phils are the 5 time defending NL East champions and it doesn’t look like they’ll give up that title in 2012. Although the 4 teams below them could very well give them a run for their money. The Phillies pitching staff is still the best in baseball. Rou Halladay, Cliff Lee, and Cole Hamels should all have great years if they stay free of injury. What might hurt the Phillies is the fact that both Ryan Howard and Chase Utley are hurt right now and that will slow down their offense at least for the start of the season. All in all, the Phils should top the division in 2012. 2. Miami Marlins, The Marlins have a new logo, a new look, a new ballpark, and a new manager this year, The Marlins also have some new talent with Mark Buehrle, Jose Reyes, and new closer Heath Bell. The Marlins should be pretty good this year and will challenge the Braves, Nationals, and a few other teams for the 2 Wild Card spots in the National League. Expect the fish to win anywhere from 70-90 games in 2012. 3. Atlanta Braves- The Braves came oh so close to making the playoffs in 2012. But an epic September collapse plus a late surge by the soon to be World Champs eliminated them on the final day of the regular season. This year the Braves will be back with a pretty solid offensive lineup led by guys like Dan Uggla, Brian McCann and the soon to be retired Chipper Jones. Pitching wise Tommy Hanson should be the one leading the rotation and they still have a closer Craig Kimbrel who for most of his rookie season, was lights out. The Braves should again contend for the Wild Card in 2012. 4. Washington Nationals- The Nationals could be a dark horse in 2012. They’re finally going to get a full year of Stephen Strasburg, Ryan Zimmerman just signed a large extension, Mike Morse is back after having a breakout year of sorts last year. The new face Gio Gonzalez should do well in the rotation and should make the rotation stronger and better. Heck we may even see Bryce Harper before the year is over. The Nationals may not be a full contender yet, but they could surprise some people in 2012 and make a run at one of the 2 wild card spots. All in all, I think this will be the year the Nats finish with a winning record and should be in contention till at least mid September. 5. New York Mets- The Mets seem to be going nowhere right now. Their owner is in the middle of a lawsuit, the front office doesn’t have much of a budget to work with, the team is bad, the farm system is not that good either, and they’re stuck in a competitive division. The Mets do have some talent in David Wright and Jason Bay although Bay has not done much since coming to the big apple. Johan Santana is coming back to the rotation and hopefully he will be able to stay healthy. But this Mets team does not look like it’s going to compete now or for years to come. It’s going to be a miserable season in Queens. That’s all for now, I’ll be back tomorrow to preview the NL Central. Previewing the whole American League. I obviously did not think it through enough when I decided to do 30 teams in 30 days. I wanted to preview all 30 teams but I got really busy with finishing up my final year of high school, and a bunch of other stuff so now I am going to do what the entire UCB (United Cardinal Bloggers) are doing this week for our March project, Today I will preview the entire American League. Tuesday, Wednesday, and Thursday I will go through the NL East, Central, and West. On Friday I’ll unveil my “picks” for the 2012 season. So let’s get started. The American League is going to be great to watch this year. I have 7 teams in the AL that I think could make a run at the playoffs. In the East, you have the Yankees, Red Sox, Rays, and Blue Jays. The Yankees are the Yankees and they’ll always be competing. Especially when they have guys like Mark Teixeira, A-Rod, Derek Jeter, and in the starting staff the ace CC Sabathia. No doubt the Yankees will be good in 2012 but can they win the Division? The Red Sox will be back with pretty much their entire team from last year. Will they be able to put the collapse behind them? How will Bobby Valentine do in his first year as manager? and how will Daniel Bard do as he makes his way from the bullpen to the starting staff? The Rays will contend in the east as well. They’ve got that powerful offensive lineup with guys like Longoria, Upton, and Carlos Pena, a decent starting staff as well. Also, don’t be suprised if the Blue Jays at least make a run at one of the 2 wild card spots. They are a team with a lot of young talent and it could take them far. In the A.L. Central it’s pretty much the Tigers…and everyone else. The Tigers are for sure the team to beat in the central this year. The reigning AL Cy Young and MVP Winner Justin Verlander is primed for another great year. The offense is led by Miguel Cabrera and newcomer Prince Fielder. This is a Tigers team that in my mind could very well win 95-100 games in 2012. The big question in Motown? how will Miguel Cabrera handle third base?? The AL West race is going to great to watch. The Texas Rangers are the 2 time defending American League Champs. But the Halos have reloaded with Albert Pujols and C.J. Wilson. The Angels just might have the best overall rotation in the American League this year. Cy Young contender Jered Weaver is back, Dan Haren, is back, they just added C.J. Wilson and they also have Ervin Santana who of course threw a no-hitter last year. The Rangers are still stacked as well. Their powerful offensive lineup still includes, Nelson Cruz, Mike Napoli, Ian Kinsler, Adrian Beltre, and of course Josh Hamilton. Plus they have a new addition to the rotation in Yu Darvish. It should be interesting to see how things turn out in the AL West this season. Today we begin looking at the AL West, starting with a quick look at the halos. It’s fair to say the Angels had the most impressive offseason in baseball. They came out of nowhere to sign two HUGE free agents. Albert Pujols, the best offensive player in the game and CJ Wilson the former Rangers ace. The Angels add Wilson to an already solid starting staff that includes Jered Weaver, Dan Haren, and Ervin Santana who threw a no-hitter in 2011. The Angels pitching staff is probably the best in the division. The Angels offense will be led by Mr.Pujols and besides that the Angels starting lineup could be a whole bunch of different combinations this year although expect Erick Aybar and Howie Kendrick to be the men hitting in front of Albert. This should be a great year for the Halos, if they don’t win the AL West, I see them getting one of the two AL Wild Card Spots. Mlblogs the official website of Mlblogs!!! Mlblogs Central the official blog of Mlblogs!! Go here for updates on the site, see the latest leaders, and meet fellow bloggers! loukid93@hotmail.com my email, feel free to send me a message anytime. Twitter Feel free to follow me on Twitter! !